Tang Drink Mix Guava Pineapple. 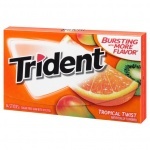 Ingredients: Sugar; Citric Acid; Contains Less than 2% of Natural and Artificial Flavor; Ascorbic Acid (Vitamin C); Vitamin A Palmitate; Beta-Carotene; Vitamin E Acetate; Niacinamide; Riboflavin (Vitamin B2); Vitamin B6; Calcium Phosphate; Acesulfame Potassium, Neotame, and Sucralose (Sweeteners); Cellulose Gum (Provides Body); Sodium Citrate; Artificial Color; Red 40; Red 40 Lake; Yellow 6; Blue 1. 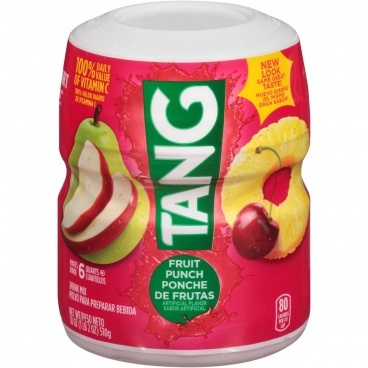 Instructions: Directions: Measure Tang Brand Drink Mix, using cap, into plastic or glass container. Add cold water; stir to dissolve. Serve over ice or refrigerate. To make 1 serving, use 1-1/2 level tablespoons Tang Drink Mix and add cold water to make 1 cup (8 fl. oz.). To make 4 servings, use Tang Drink Mix up to 1 quart line inside cap and add cold water to make 4 cups (1 quart). To make 8 servings, use Tang Drink Mix up to 2 quart line inside cap and add cold water to make 8 cups (2 quarts).